Click on the "Select Data File" button (outlined in yellow) to select a database. 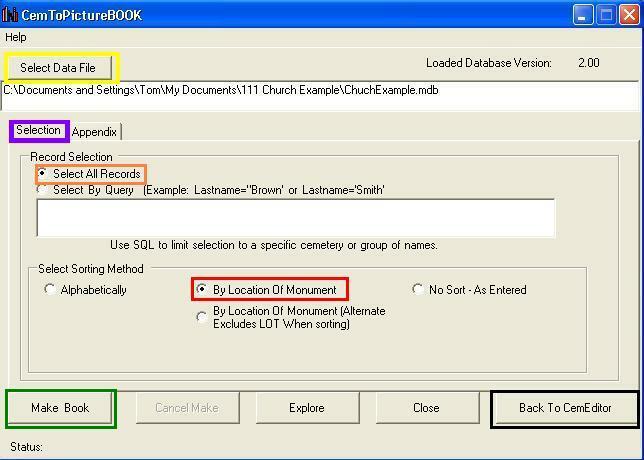 Default database is the current database in the CemEditor. Click on the "Selection" tab (outlined in purple) and the following screen will display. The original CemToPictureBook is preformatted to create pages containing 10 entries per page. For each entry the following is created: Lastname/Surname, Firstname, Birth, Death, Aged, Section, Lot, Row, and Stone. Select ALL to choose every record in the database. The normal setting is outlined in orange. Select OTHER to create books using other criteria. More help. Sort alphabetically, by location of grave, or no sort. The recommended setting is "By Location". The normal setting is outlined in red. Click on the "Appendix" (outlined in white) in Tab and the following screen will display. 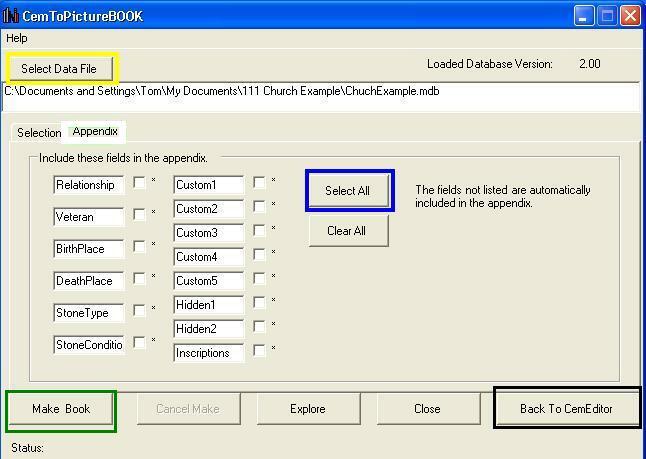 Select the fields to include in the appendix of the book. Use the "Select All" button (outlined in blue) to include all fields. The program will place the current cemetery name and page number at the top of each page. MAKE BOOK - Click on the "Make BOOK" button (outlined in green) once you have finished and CemToPictureBook will begin making your transcription book. EXPLORE - (outlined in blue) Opens the Windows Explorer to the current folder containing your BOOK file(s). BACK TO CEMEDITOR - (outlined in black) This button closes the CemToPictureBOOK and opens the CemEditor.